I accidentally broke Ben’s clock. I knocked it off the wall, thinking I was reaching for the light switch, and it fell on the floor and broke. We love Ben’s clock. It was a gift from his sister and always entertains visitors to our house. Ben and I spent a bit of time yesterday afternoon finding a replacement online and it turns out he’s quite fussy. While he loves the old clock the 11 has always bothered him since it’s not exactly 11 and requires a bit of rounding. 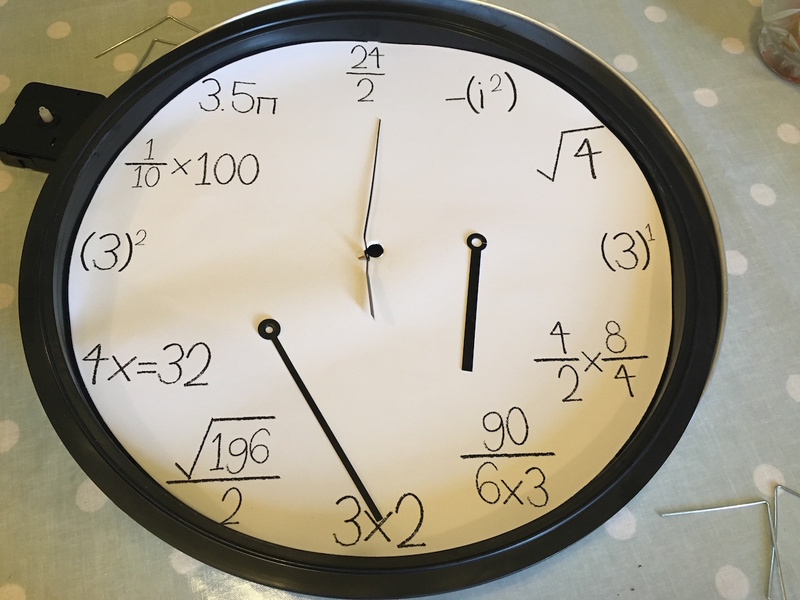 And when I found an algebra clock, not unlike the one below, he dismissed it with, “That’s not algebra; that’s arithmetic”. We ended up finding one he’s happy with and it’s on its way! I’ll post a pic once we’ve got it. Posted in Journal and tagged clock, clocks, mathematician, Mathematics. Bookmark the permalink. But the original only has the two bits of algebra (not totally sure if i^2 even counts) and the other one shown has four. I don’t think Ben would classify the original as having any algebra either. We weren’t looking for one exactly the same as the original. I just happened to see one that was advertised as being an algebra clock. Oh no! The old one broke; it looks cooler than the other ones in this post. Hope the new one is cool as and looking forward to its photo.